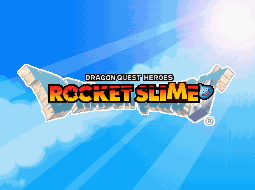 ... Dragon Quest Heroes: Rocket Slime for the DS. I know this will shock some of you, but I've already started playing this TOSE-developed, Square Enix-published title. 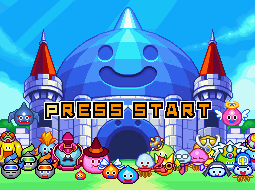 I haven't played enough of it to share any worthwhile impressions, of course, but I will say this: I knew I was going to enjoy it as soon as I encountered its adorable title screen (below)--what with its explosion of bouncing, grinning slimes. Also, I'm already in love with the game's pixel-perfect graphics and the protagonist's "Elasto Blast" move. I'd previously been "warned" (in a good way) about the addictive properties of the latter, but even then I wasn't fully prepared for just how fun it would be to launch Dragon Quest Heroes' Rocket every which way. Anyway, expect to see an impressions post (titled something like "My Month with Dragon Quest Heroes: Rocket Slime, Part 1") pop up this coming weekend. In the meantime, have any of you played this one? If so, what did you think of it? YES! I love this game so much. It's fairly simplistic and easy (I 100%ed the game without even thinking about doing so), but I'm totally OK with that! It's charming, funny, and awesome-looking. One of my favorite DS games ever! I played it straight through, and I loved every minute of it. The gameplay is so fun, and the epic battles are...well...epic. It's frantic. It's cute. And it's not too hard! What more could you ask for?! I remember enjoying this game greatly, though the ship battles were occasionally tedious to me. Oh! I always thought they looked like the best part! Of course, I haven't participated in one yet. Hopefully tomorrow? Wahoo! This looks utterly adorable, Bryan! I've never been a huge fan of slimes or Dragon Quest, but this game looks like tons of fun! Looking forward to hearing your thoughts. You ... you aren't a fan of Dragon Quest slimes? What's wrong with you, Anne? I kid, I kid! Seriously, though, those little buggers are so cute I don't understand how anyone could hate them.